An antique (Latin: antiquus; old) is a collectible item desirable because of its age, rarity, condition, utility, or other unique features. It is an object which has reached an age which makes it a witness of a previous era in human society. Antiques are usually objects which show some degree of craftsmanship, or a certain attention to design such as a desk or the early automobile. In a consumer society, an antique is above all an object whose atypical construction and age give it a market value superior to similar objects of recent manufacture. Historical museums make considerable use of antiques in order to illustrate historical events and give them a practical context. An item which is at least 100 years old and is collected or desirable due to rarity, condition, utility, or some other unique feature. Motor vehicles, tools, and other items subject to vigorous use in contrast, may be considered antiques in the U.S. if older than 25 years, and some electronic gadgets of more recent vintage may be considered antiques. Any piece of furniture or decorative object or the like produced in a former period and valuable because of its beauty or rarity. The United States Tariff Act of 1930 exempted from import duty items of historical or artistic significance produced prior to 1830, and that became a standard internationally accepted date for the definition of antiques. Subsequently, the United States Customs Office redefined antiques as items over 100 years old. Just about any object can become an antique if it survives long enough, but the value of an antique in the marketplace is determined by its appeal and social acceptance. In addition to being popular among individual collectors for their uniqueness or monetary value, antique versions of daily use items are used by museums to provide historical context for their exhibits. The alternative term antiquities is commonly used to refer the remains of ancient art and everyday items from antiquity, which themselves are often archaeological artifacts. 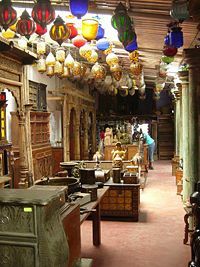 Interior of an antique shop. "Antiquing" is the act of shopping, identifying, negotiating, or bargaining for antiques. Items can be bought for personal use, gifts, and in the case of brokers and dealers, profit. Antiquing is performed at garage sales, estate sales, resort towns, antiques districts, collectives, and international auction houses such as Christie's and Sotheby's. Note that the word "antiquing" may also refer to the art of making an object appear antique through "distressing" or applying an antique-looking paint application. Antiques may be bought at antique shops, or passed down as an estate. Some valuable antiques can be bought from antique dealers and auction services or purchased online through websites and online auctions. Antique dealers are often members of national trade associations, many of which themselves belong to International Confederation of Traders in Works of Art (CINOA), a confederation of art and antique associations across 19 countries, representing five thousand dealers. An antique shop (or antiques shop, especially in the UK) is a retail store specializing in the selling of antiques. They sell unique items and are typically willing to buy items, even from individuals. The quality may vary from very low to extremely high and expensive, depending on the nature and location of the shop. There are many categories of popular antiques. Some of the more popular types include furniture, cars, and firearms, as well as farm equipment, toys, art works, jewelry, carpets, and examples of all types of tools and earlier technologies. The collecting of antique furniture is particularly popular due to the practical characteristics of these antiques. Antique furniture includes dining tables, chairs, bureaus, chests and so forth. The most common woods are mahogany, oak, pine, walnut, and rosewood. Each wood has its own distinctive grain and color. Many modern pieces of furniture often use laminate or wood veneer to achieve the same effect more cheaply. 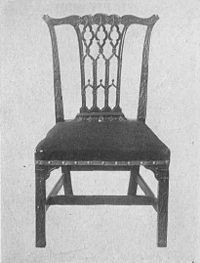 A Chippendale-style chair, with elaborate ribbon back. There are many different styles of antique furniture depending on when and where they were made. Furniture can be a product of artistic design and so may be considered a form of decorative art. In addition to furniture's functional role, it can serve a symbolic or religious purpose. The earliest furniture was understandably very primitive and only practical, but gradually the furniture also began to have more importance and it became decorated. At this point, furniture became an early status symbol. Wealthy homeowners became more refined and demanded that their furnishings reflect their status and lifestyles. Early furniture has been excavated from the eighth-century B.C.E. Phrygian tumulus, the Midas Mound, in Gordion, Turkey. Pieces found there include tables and inlaid serving stands. There are also surviving works from the ninth and eighth-century B.C.E. Assyrian palace of Nimrud. The earliest surviving carpet, the Pazyryk Carpet has been dated between the sixth and third century B.C.E. and was discovered in a frozen tomb in Siberia. Recovered Ancient Egyptian furniture includes a third millennium B.C.E. bed discovered in the Tarkhan Tomb, a circa 2550 B.C.E. gilded set from the tomb of Queen Hetepheres, and a circa 1550 B.C.E. stool from Thebes. Ancient Greek furniture design beginning in the second millennium B.C.E., including beds and the klismos chair, is preserved not only by extant works, but by images on Greek vases. The 1738 and 1748 excavations of Herculaneum and Pompeii discovered Roman furniture, preserved in the ashes of the 79 C.E. eruption of Vesuvius. 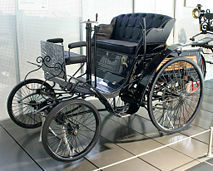 Although automobiles are a more recent invention, many collect what are considered to be antique models of cars. An antique car is generally defined as a car over 25 years of age, this being the definition used by the Antique Automobile Club of America and many other organizations worldwide. However, the legal definition for the purpose of antique vehicle registration varies widely. Twenty-five years is about double the design life of modern cars and an even greater increment on those cars now 25 years old; therefore, a car that has reached 25 is a rare survivor, and generally not economic to maintain as regular transportation. Owning, restoring, and collecting antique cars is a popular hobby worldwide. Some consider such collectibles to be a form of investment. Buying a particular antique car is then done primarily in view of profit in a future sale and not for the enjoyment of driving it or taking pleasure in restoration work. As with art collecting, antique car collecting contains a high risk component. The market for antique cars fluctuates greatly over the years—there have been periods which have seen strong and continued increase in price, but other periods which saw precipitous declines. Antique guns are collected by enthusiasts around the world. The particular interests of antique gun collectors vary, but guns are almost universally admired for their craftsmanship. They are often seen as artifacts of history, such as the Franco-Prussian War, the Sino-French War the Boxer Rebellion, the Anglo-Zulu War, the War of the Pacific (between Peru, Bolivia, and Chile) the Spanish-American War, the First Italo–Ethiopian War, the Boer Wars, the Yukon Gold Rush, settlement of Australia's Outback, the U.S. Indian wars, and settlement of America's western frontier (commonly called the "American Old West"). These guns are also seen as reminders of epic expeditions, pioneering railroad expansions into wilderness areas, and of the golden age of big game hunting throughout Africa, India, and the United States. Given their scarcity, the prices of antique guns have steadily risen. Some highly desired brands such as Colt and Winchester have tripled or quadrupled in value. Current prices are best monitored by comparing prices at gun shows, and by checking references such as the book Flayderman's Guide to Antique American Firearms and Their Values. Gun control laws with respect to antique guns vary widely from country to country. Several nations such as Australia, Canada, Norway, the UK, and the United States make special exceptions in their gun laws for antique firearms. The "threshold" or "cut-off" years defining "antique" vary considerably. The threshold is pre-1898 in Canada, pre-1899 in the United States, and pre-1901 in Australia. Some countries, like England, exempt certain antiques but they do not set a specific threshold year. Other countries treat antique handguns and long guns differently. For example, Norway has a pre-1885 threshold for rifles and shotguns, but a pre-1871 threshold for handguns. Items for sale at an antique shop in Kabul. Restoration of antiques may refer to either the practice of restoration—restoring an antique or work of art to a like-new condition (or what might be perceived by a viewer or potential buyer as like-new), or conservation—the practice of preserving an antique or work of art against further deterioration. Restoration can be as simple as light cleaning to remove disfiguring dirt or grime, such as on the surface of a painting, or it may include near complete rebuilding or replacement, as might be the case with old automobiles or furniture. Often done in preparation for sale, or by a collector upon acquiring a new piece, the main goal of restoration is to "restore" its original appearance or functionality. There is a great difference between restoring and repairing. One may achieve functionality with a repair, but to restore an item properly is an art-form. Finishes can be stripped and redone, but it is essential that the original patination is retained, if possible. Stripping is only done as a last resort, especially with antique furniture. Refinishing antique furniture can reduce the value to a fraction of its appraisal value in some cases. Engines might be rebuilt with new parts as necessary, or holes in a silver pot might be patched. While some of these practices are frowned on by many museums, scholars, and other experts, for many people there is little value in an antique that is unusable or cannot be displayed. Restorers are often trained craftspersons, such as furniture makers, mechanics, or metalsmiths. Some have years of experience in their fields, others are self-taught volunteers. Many of the antique aircraft around the United States are restored by trained aircraft engineers assisted by volunteers, some of whom flew those same aircraft years ago. In contrast, conservation typically aims to preserve the remaining material as being worthy or valuable on its own without necessarily being functional or looking new. There are several criteria for what work is necessary and how far to take any work performed. Chiefly, is the object actively deteriorating? Slowing or stopping deterioration and eliminating or mitigating the root cause is the first task of the conservator. To this end, conservators are usually trained in the science of materials and chemistry, as well as art history, archaeology, and other disciplines related to their areas of expertise. As antiques can be valuable, there exists a lucrative incentive for people to forge or counterfeit them. The ambiguous nature of the origins of many antiques makes it difficult to ascertain their legitimacy. False claims are made as to the age or source of many items. Art historians and antique dealers apply their training to compare suspected pieces to other known antiques. These experts rely on extensive background knowledge of the methods of production and details of each piece to reach their conclusions. Techniques such as carbon dating may also be employed to accurately test the age of items. ↑ Antiques Speak Antiques Roadshow. Retrieved May 2, 2007. ↑ Antique Paper Curbly. Retrieved April 30, 2007. ↑ How to Give Furniture an Antique Look. eHow. Retrieved April 30, 2007. ↑ CINOA CINOA. Retrieved April 30, 2007. ↑ Phyrgia, Gordion, and King Midas in the Late Eight Century B.C.E. The Metropolitan Museum of Art. Retrieved April 30, 2007. ↑ Pazyryk Carpet. House of Persian Rugs. Retrieved April 30, 2007. ↑ Club History Antique Automobile Club of America. Retrieved April 30, 2007. Antique Furniture Timeline covering the period 1650 to 1950. BBC Antiques section - the BBC website has an informative section on antiques. CILSS, English Periods and Styles of Antique Furniture. This page was last modified on 6 April 2016, at 19:40.